Did you hear me scream when Christian won Project Runway??? *big pout* Really. It was so obvious that Rami should have won. I’m totally bummed. Now if Ben gets voted off Make Me a Supermodel tomorrow night, I will burn my TV in protest. ugh. I forgot that I hadn’t posted a couple of scrappy things that I’ve done recently. This one I did almost a week ago. I had to document my sadness that I won’t have any pictures of my boys with Santa for this past year. Total bummer. These are some cards that I made out of a kit I got at Archiver’s. 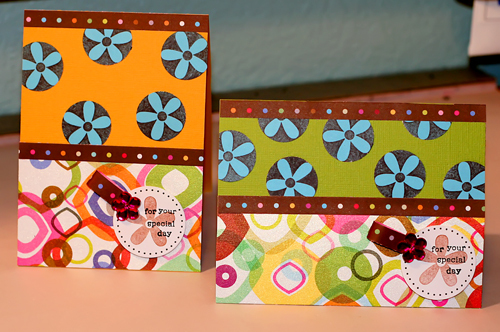 These papers are so totally *not* my style, so I thought I would make cards out of them. And because I had no new pictures to share, I had Wade take one of me. lol. 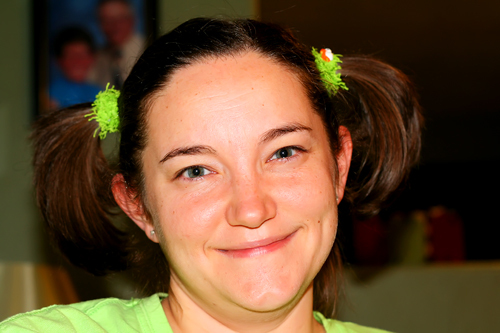 I am sporting my favorite hairstyle tonight…PIGGIES! Yes, pig tails! My hair is so short right now, it is the only way to get all of my hair up and out of my face. Some people may think that I need to act my age, but I say to them….phphphptpthptphptphtptptpttttttthhhhhhhhh. You are only as young as you feel. And when I wear piggies, I feel like I’m 20 again. Gotta love that. And my closest friends will notice that I have my Oscar the Grouch hair bands in. They make me happy. Tonight, I am seriously trying to get to bed before 11. Wish me luck! I think you should loan those Oscar bands to MK for the next CHA, they match her badge holder:) I love the cards and of course the layout. Congrats on Day 3! I always love your comments. They leave a smile on my face. But seeing the kids or you and Wade looking a bit silly…. now that’s priceless! I see Oscar and Dead Oscar are making an appearance. Ha. ACK!!!! You need to put a spoiler alert on things like this. I had my photography class last night and didn’t get to watch. You can pout all you want, but you should have prepared yourself. It’s so the PR way…who’s the loudest designer with the most airtime and you can foreshadow the winner. Oh well, at least he has some talent and is not a femme-bot. First, the banner is better. Much better. Love the layout and cards, and you are too cute in your piggies – not only do you feel 20, you look 20. I wanna know your secret! Whoa. I’ve been monitoring the blog banner change all day. What was with the orange paint swirls? Like the daisies a lot. Did you tell Vivian, looking younger than your age runs in your genes?!?!?!!?!? Love you all. LOVE the piggies! 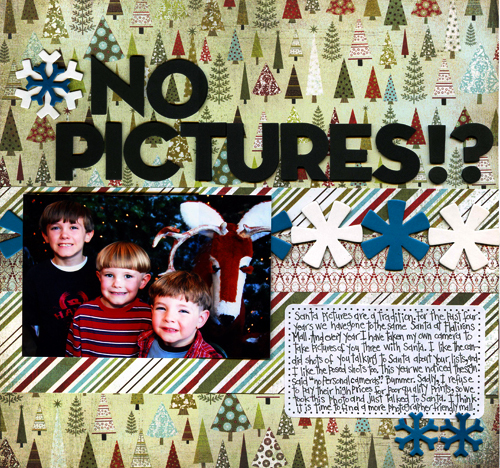 your blog banners have been great! so here’s that post and YES, i did hear you scream! keeping in mind that i don’t watch tv much. i did fall victim to project runway in the final 6 or so people left. THEN i was watching it like a hawk. HA! i SO wanted rami to win. i felt like he had evolved from his layering stint and came out with a fantastic show. darn that christian! and if i hear “FIERCE” one more time, i’m going to puke!